Secretly, journalists had to be asking themselves why more people weren’t up in arms in Ferguson, Missouri last week as “lookie-there” reports circulated about the tiny number that were torching the private property of neighbors in response to a grand jury report. I don’t mean to be cynical. Virtually no one on the front lines in that highly competitive and breaking news-obsessed line of work has the luxury of mindfulness or even personal accountability when it comes to fueling the “rush to judgment” these story feeding frenzies create. Nor do they seem to ever go near the issue of personal responsibility unless it is white collar crime and related to a fall from grace. Take away the relatively small number among us on either side of that tragedy that made up their minds with far too little information and then further subtract those of us who seemed to have formed an opinion just to reinforce a larger point and we’re left with the vast majority of us who simply have compassion fatigue. From the beginning, even after I passed through there at the height of turmoil last summer, none of the narratives in the Ferguson case fully made sense to me. Not even the incredible job ProPublica did on crunching data seemed to go anywhere near deep enough to draw conclusions beyond better policing. The topic of race seems to inhibit any effort to look for deeper social influences. I’ve always got the impression I am slightly progressive leaning as an Independent because of my concern for social justice but it is increasingly clear at times like this that I may be among the 10% of voters who truly are straight up Independents. Part of the reason is compassion fatigue brought on, in part, by well-meaning folks who want to do right but pile on seemingly without a clue. Are there rogue cops? Yes, but not nearly as many as there are on TV shows or in movies where the predictable narratives skew either that way or to superhuman. Is everyone who acts out in response to authority, guilty of something? Not unless you throw in those with mental disabilities and those who are just being jerks. I’ve sat in enough rooms over the years with very well-meaning people, including those who are or have been underprivileged, to know that the latter have compassion fatigue too, but more so, they hate to be patronized. I remember having a discussion about adopting a metric to measure closing gaps in school achievement when a county manager began to lecture me that studying and publicizing gaps would be racist. No one deserves to die but everyone involved plays a role when these things occur. Focusing only on police restraint or latent racism by either party seems to fall short. More than a decade ago, a friend of mine in education would often explain to groups that closing the achievement gap in schools had to take place between kindergarten and third grade because some children started out already more than a thousand books behind. Unspoken though, because no one wanted to go there, was why were they so behind and how do we change that? 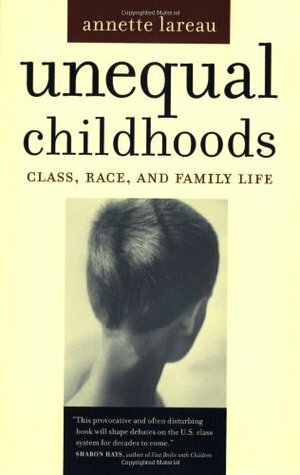 During the events in Ferguson, I reread a updated edition of a book I had read back then entitled, Unequal Childhoods: Class, Race and Family Life by Dr. Annette Lareau. It is based on in-depth observations over time of 88 African-American and white families across the spectrum from middle class, working class and poor families with children ages 9 and 10, of which twelve are discussed in the book. There were families of each race in each class but the definition of class was a combination of both household income and education level. Lareau and her researchers also did a follow up ten years later. She found that all of the parents wanted their children to be happy and to thrive but they fell along a spectrum of parenting about how to do that. At one end, there is extreme “natural” parenting and at the other extreme “concerted cultivation” parenting. In the extreme, both styles have pros and cons. For example, during my pre-school years, my parents had a natural style but as I grew up, it evolved more toward concerted cultivation. But either way they were probably always more to the center of the spectrum. I also had a number of friends raised at each end of the spectrum. Looking back now, my parents, one of whom did not complete high school and both of whom worked more than one job at times to pull themselves barely into the middle class, did a very good job. Lareau wasn’t looking for an either/or answer but a correlation to what would predict an upwardly mobile trajectory for those in poor or working class households and what links there might be for keeping middle class children from downward mobility. For a quick video overview of the times per week the researchers spent observing the children both in school and within the home as well as the follow up ten years later click here. I have found that many people talk about this study without ever having read either edition of the book so I definitely recommend reading it cover to cover more than say an overview such as the one linked here. The positive links she found to upward mobility or sustaining middle class status once achieved vs. cycling downward didn’t relate to race as much as they did social class and parenting style. A third of Americans raised as middle class (income) fall out of the middle as adults including 38% of black men and a somewhat lower proportion of Hispanic men. Achievement gaps on test scores play a role. A lot of things can affect how things turn out for us as adults but Lareau’s studies are particularly fascinating because they provide insight into the interplay of parenting, neighborhood and institutional influences. For parents who are poor or working class, a natural style of parenting becomes the default because the logistics of housing safety, clothing, doctors appointments, getting to bed and ready for school, not to mention putting food on the table often take precedence. The natural parenting style tends toward directives and completely unstructured and undirected play time. But it isn’t just less intensity about organized leisure or learning activities that differentiates the natural style. There more likely isn’t the time to interact by answering questions with questions and exploring options such as certain behaviors or coaching on how to deal with authority and institutions or how to question adults….or reading books. Clearly the boys in Ferguson not only knew how to blow off authority and social norms but apparently may have also over reacted. It doesn’t excuse shooting them either, but there has to be some accountability on both sides. Police restraint is not the panacea. Of course, many of us see when the concerted cultivation style goes awry, e.g. domineering helicopter parents, a sense of entitlement that it is the job of parents to make sure a child is never bored and far too little unstructured time. But the true value of the concerted cultivation style is having conversations with children where they explore feelings, thoughts and options as well as learn to learn by reading books well in advance of formal schooling. Any effort to ensure social justice, including addressing poverty, needs to be informed by Dr. Lareau’s research and others. She talks about race and distrust of the police regardless of class. But she sees more potential solutions looking at class. My friends on the left often point to the robotic, lockstep manifest by many on the right and they are right to be concerned. But even among those deeply concerned with social justice it is important to guard against becoming brittle, rigid and kneejerk in its pursuit. And those who react forcefully to the notion that poverty can become a culture need to come to the realization that not everything is about race.